In Destreza, there is a technique known as the “movement of conclusion”, so called because when executed properly, it normally ends the fight. Unfortunately, when executed improperly, it also normally ends the fight. Fundamentally, the movement of conclusion consists of grasping the opponent’s hilt, hand, or arm with your off-hand and striking with your sword. This can be done in a number of different ways, but the basic principle is always the same – control the weapon, and you can kill them at your leisure. Before looking at specific entering techniques, let’s consider the final position and strike. 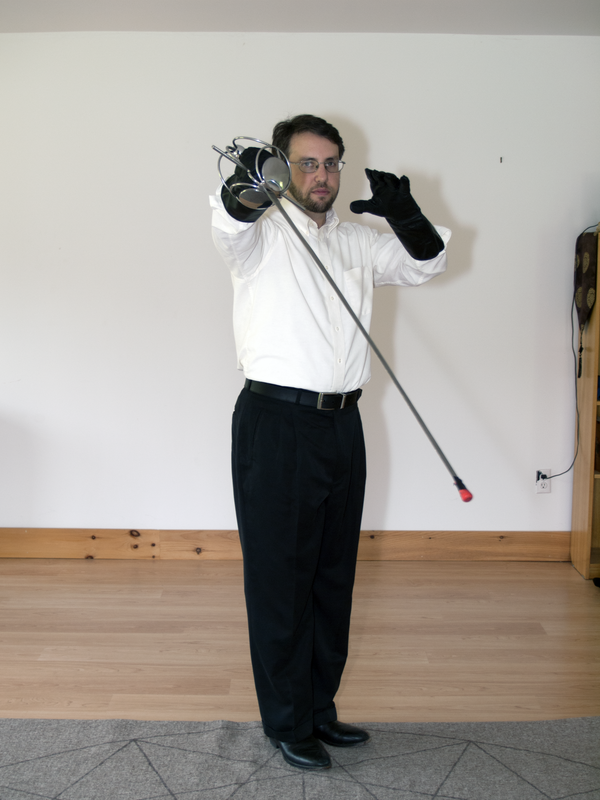 Period rapiers are well-suited for grabbing. They have lots of complicated hilt structures that can be easily grasped, and the grip is such that it’s difficult for the wielder to twist the weapon to escape the grab. The downside of trying to grip the weapon itself is the possibility that you miss and end up grabbing the blade – this, as you can imagine, is likely to end badly. For this reason, I personally prefer to grab the hand or wrist of the sword arm. This gives the opponent less leverage and fewer degrees of freedom to escape, at the cost of a less-secure grip. It is important to grab below the elbow, however; otherwise, you have not controlled the arm and will certainly be hit. Ideally, the grab should be performed from the outside line. The danger is that, having lost control of their weapon, the opponent will most certainly try to punch you with their off-hand, kick you, etc. By staying to the outside, you can limit their available weapons, at least long enough to strike with your blade. That said, if the inside line is what’s available, it’s certainly better to have control of their blade than not to have control of it – you simply must be prepared to strike instantly, and be prepared to take some damage in the process. What kind of strike should one use in the movement of conclusion? The answer is the same as in any other case: whatever is available. 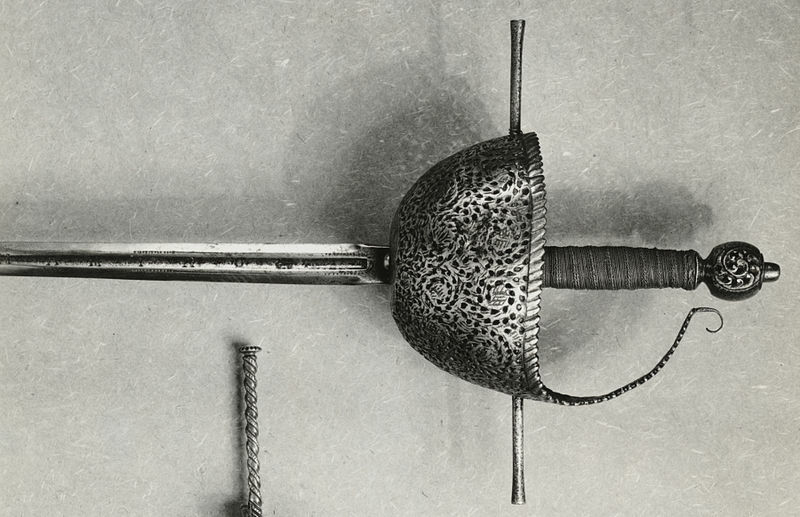 In general, all rapier styles prefer the thrust because it’s faster and more damaging, but the movement of conclusion is necessarily performed from close range. 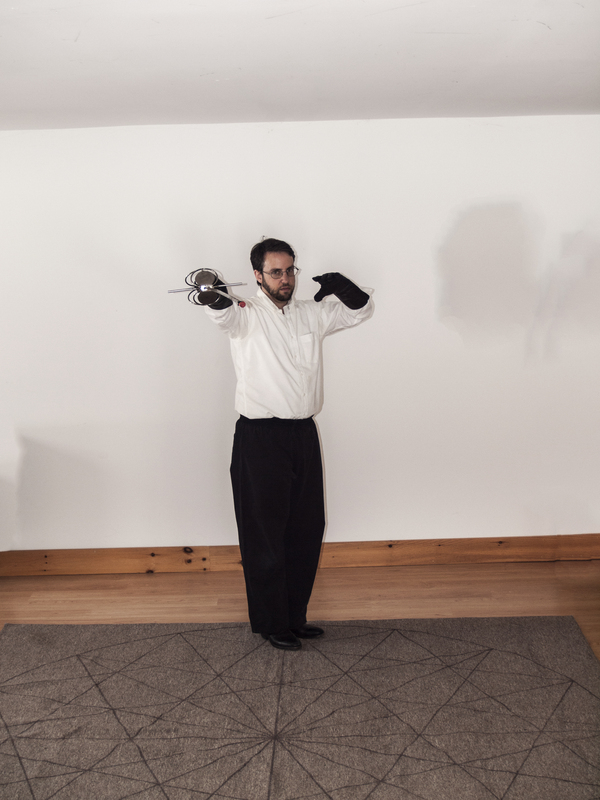 Ideally, one does it with the left hand advanced and the sword hand held back in a striking position. If that’s not possible, the movement of conclusion allows enough time to perform a full-circle cut, which will normally end the fight or at the very least offer a window in which one might execute the thrust. All right, so now we know where we’d like to get to – left foot advanced, in the opponent’s outside line, holding their right wrist with our left hand and thrusting with our blade. How do we get there without being hit along the way? As with most other techniques in Destreza, this relies on the atajo and blade control. The simplest version of the movement of conclusion starts with an atajo on the high-inside line (that is, your blade is atop theirs, your hand is in their inside line, and your point is in their outside line.) From this position, you sweep their blade down and out, ending in the low-outside line (so assuming right-handed fencers, their blade is to your right and below your hilt). During the blade movement, you perform a transverse left step, which places you within reach of their hand with your left foot advanced; from there, the fight can be “concluded” by controlling their arm and lifting your point into thrusting position along the diameter. This technique can also be performed via an atajo from below with a bind into the high-outside line. A slightly more complex version starts with an atajo from above in the outside line (that is, your blade is crossing from their high-outside line to their high-inside line.) In this position, if you perform a bind as above, you’ll end up in their inside line – not impossible, but not ideal. Instead, if you simply move in with a left transverse step as if you were going to perform a thrust in opposition, they will necessarily parry into their high-outside line. If they also execute the proper Destreza response and take a lateral step to their left, you must give up and move out again (or change to a different line of attack); however, if they don’t move, you can likely take their hand and release your blade for the thrust. An interesting variant on this technique places the diestro on the inside line and very close to the opponent. This situation often arises when using the hanging guard discussed in a previous post. If the opponent attacks over the blade (that is, in your low-inside line) and overcommits, one possible response is a right transverse step into the attacker’s inside line. 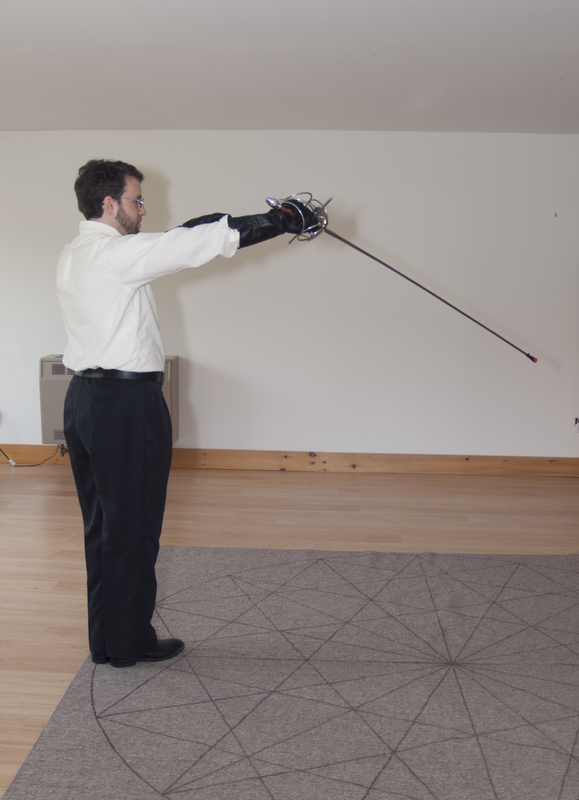 You can then reach under your own blade to grasp the attacker’s hand. At this point, you have performed a movement of conclusion, but it’s left you in a fairly awkward position and in some danger, since you’re on the inside line. You have two choices: you can step to your left, moving their hand with you, or you can step in. If you step left, you will open up enough space to execute a full-circle cut from the outside line (that is, your blade moves counter-clockwise over your own head to strike the opponent from your right). This motion also takes you away from the opponent’s left hand, which is presumably trying to hit you. If, instead, you step directly towards the opponent, you no longer have enough space to free your blade. 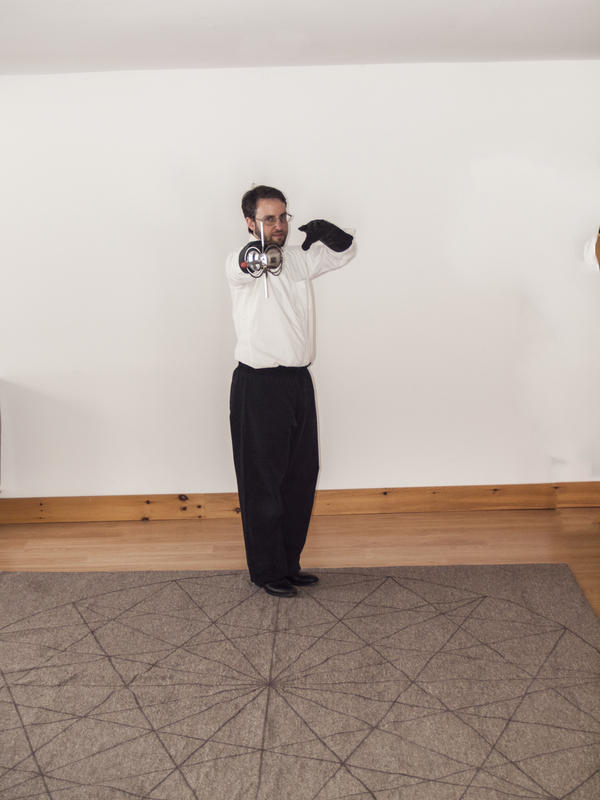 However, you can instead strike with the hilt, either with the pommel or the quillons depending on position, and this gives you the opportunity to raise your elbow to protect your head from their left hand. The major danger of the movement of conclusion is failing to get, or keep, control of their weapon. If you try to grasp their hand and miss, you’re in deep trouble. Generally the best you can do at that point is to make your attack anyway and simultaneously try to move away from the opponent again. The attack will not likely succeed, but it might delay them long enough for you to re-establish a safe distance. Note that this is not the same as, say, DiGrassi’s “hanging ward”, where the sword hand is actually held above the head. The Destreza hanging guard is a primarily defensive stance; by adopting this position, the diestro has “gated” the attacker into two lines: above the blade, or below the blade. In either case, a very small movement of the diestro‘s body will close the line being attacked, making it very difficult to strike someone in this guard. For example, if the opponent attacks above the diestro‘s blade, a short lateral or transverse step to the left will close the line with opposition (moving the opponent’s sword), with no blade movement required. If the opponent attacks below the blade, a transverse step to the left with a body turn will close the line and also align the diestro‘s blade onto the diameter (ready for a counterattack). The primary disadvantage of the hanging guard is that the point is not exactly in line. If done correctly, the point will be in a position such that it will strike the opponent in the right hip if he advances down the diameter, but a small deviation from a direct approach, or a light contact from the opponent’s blade, will cause this to miss. Also, holding the blade at an angle decreases the diestro‘s reach, potentially allowing the opponent to enter deeper into the circle before he encounters resistance. This differs from the historical version in that the edge of the sword is out, rather than down. I don’t know when this change was made, but I can speak to the advantages and disadvantages of this position. The principal advantage is that it is a more relaxed and more structurally-sound position for the arm; this yields quicker, stronger movements. The principal disadvantages are that this costs you a small fraction of reach, and moves the body of the blade off the direct line between you and your opponent, making it slightly easier for him to pass the point of the blade. The historical right-angle guard is comparable to the center-line guard in modern fencing. It shortens the distance to either the inside line or the outside line, at the expense of closing neither. The modern version of the right-angle guard closes the high-outside line, reducing the number of possible defenses among which the diestro must choose when an attack comes in. The right-angle guard (either the historical or modern version) is more of a psychological stance than a physical one. The purpose of it is to hold the opponent at a greater distance and make him more hesitant to approach along the diameter. It is defensively weaker than the hanging guard, and offensively only slightly stronger (since snapping the blade into line from the hanging guard is a very quick action), but the effect on the opponent’s mind often makes it worthwhile. The hanging guard “gates” the attacker into two lines, and thus greatly reduces the number of defensive options. The right-angle guard doesn’t do this – the attacker may attack on any line he chooses, though the position of the sword technically prevents an attack in the high-outside line (this doesn’t actually reduce the attacker’s options, since the guard provides minimal actual coverage). Thus, when defending from the right-angle guard, the diestro must choose the line into which to place the attack. Usually the simplest solution is to drop the point into what amounts to the hanging guard, and react as you would if you had been using that guard in the first place. However, this leaves the question of whether to move so as to place the opponent’s blade above or below your own. For a straight attack on the diameter, it is usually faster to place the attack into the low-outside line, meaning that a step to the left will close the line. Placing the attack into the low-inside line requires dropping your point almost straight down, and this runs the risk of miscalculating and pulling the attacker’s point into your body. That said, if the attack approaches from the left side (the defender’s inside line, assuming he’s right-handed), it may be more prudent to step to the right. Regardless of the guard used, the fundamental principles of Destreza remain: when attacked, the diestro moves away from the line of the attack, closes that line to prevent the attack from following, and counterattacks into an open line. The question becomes only one of style – whether to prefer the psychological advantage of the right-angle guard over the mechanical advantage of the hanging guard. This is a slightly different topic for me. I’ve mostly been posting about kenjutsu, the Japanese sword art, but in fact that’s only one of several arts that I practice. Another is the Spanish rapier style La Verdadera Destreza (lit. “true art and skill” – in fact, the image at the top of the blog is my wife and I practicing this style.) A note about my background here: I was taught Destreza by a man who learned it while serving in the Army and stationed in Panama. He was taught by a Spanish expatriate living in Panama, who was taught the art in Spain. Assuming that all of this is true, I learned this as a living art, and (other than the few others who were taught by my teacher and the folks I’ve taught myself) I don’t know of anyone else who can say that. Many people (notably the amazing Puck and Mary Curtis, with their Destreza Translation and Research Project) are attempting to reconstruct the art from the period writings. I’ve read their work, and as much of the period writings as have been translated to English (my Spanish is, shall we say, weak…or, more accurately, completely nonexistent). The principles of what they do are very much the same as what I was taught, but many of the specific techniques are different, and there’s a body of technique around my art that isn’t documented in any of the writings. So, I thought I’d write a series of articles about Destreza as it was taught to me, for the benefit of anyone else who might be trying to learn. This first article in the series will be about the basic philosophy of Destreza, and how it differs from other similar systems; subsequent articles will look more closely at specific techniques and principles. The central tenet of Destreza is don’t get hit. That probably seems unsurprising, but it’s actually quite different from other contemporary styles, such as the far-more-common Italian and French styles. To illustrate this, picture a simple attack-defense sequence in each style. In the Italian style, a typical version would be: attacker steps straight in and attacks; defender parries (possibly attempting to hit in a single tempo). The thing to note here is that if the defender misses his parry, he’s hit. He has no backstop. An equivalent Spanish exchange would be: attacker (who we’re assuming to be Italian, since that’s what Destreza was primarily designed to work against) steps straight in and attacks; defender steps off line and interposes his sword, keeping his point in line but not necessarily attempting to hit in a single tempo. The body movement is the critical thing: as long as the defender gets off the line of the attack, it mostly doesn’t matter how badly he screws up his defense, he isn’t going to get hit regardless. Conversely, if he succeeds in interposing his sword, he’s safe even if he didn’t successfully get off the line in time. Of course, he’s sacrificed some time by stepping – his riposte isn’t going to be as fast as it would be if he stood still – but he’s a great deal safer. The theory here is to build an impenetrable defense, and wait for the enemy to make a mistake. Of course, we (the Spaniards) are going to do everything possible to encourage that mistake. In particular, by moving offline, we force the enemy to turn to address us, which Italian and French fencers aren’t necessarily used to doing; if there’s a fractional hesitation before they can reestablish the line, we have our opening. Even once the opening is found, however, our attacks are carefully chosen to maintain the exit line. Given a choice, we won’t attack straight down the enemy’s sword, because if he counterattacked simultaneously we’d both get hit. Double kills are not an acceptable outcome. We’ll nearly always move away from the sword, and preferably cover the line as well to prevent it from following us. Alternatively, we can control the sword as we move in, so that we can attack without risk of being hit. If, at any point, we feel like we’re not completely in control of the situation, we’ll abort the attack and regain our chosen distance. If an opportunity is risky, says the practitioner of Destreza (diestro), it’s not really an opportunity. We have a strong defense, time is on our side, we can wait for the next one. This philosophy shapes everything in Destreza. Next time, we’ll look at a few specific techniques, and relate them back to the central tenets. Also, in order to describe the techniques properly we’ll have to introduce the famous Spanish fencing circle, so there will be pretty pictures (or, well, pictures, anyway) next time, I promise.